We're going green for Food on Friday today – Peas and Beans (green beans, that is). Now, on to the link up. Just put your name and the name of the dish into the first Mr Linky box and paste the url for your post into the second one. Do pop by some of the other links to check them out. I'll be pinning the links to this Pinboard to make it easy to see them at a glance. If you want to know what themes are coming up for Food on Friday there is a schedule for the next few months in one of my top tabs. The Qassatat ( # 8 ) can be made with cooked or canned peas. There is a recipe for the dough included, but you can use frozen puff pastry instead. The post also has a link for the recipe for small ricotta pies. Thanks for hosting. Hope you have a great weekend! We love green beans! Green Beans Amandine are fabulous for a special meal. I am a huge fan of the legume. What a great party. Thanks for hosting. Cheers! I'm pushing the friendship my using broad beans. They are hard to get fresh here but the frozen ones work just as well. I have popped over to Jamie's Blog - those Brownies! Thanks for hosting this each week.I am joining with the party after some time.Glad to join again and hope to read some linked posts. I have just linked up 2 posts. Have a nice weekend! Cheers Carole! Have a great weekend! I've added a couple of recipes. I've not been around as much as I have in the past, but I'll add more for the past couple of weeks. Thanks for doing this Carole. 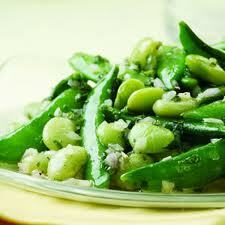 This makes me think I need to do more pea and green bean recipes! At least I have a great source for inspiration! I have learned to embrace the green beans in the farm share. Peas have always been easy to love, but the green beans took some work.